The Eagle-Grip 1 Series of lift truck attachments utilized a light duty Eagle-Grip single clamping mechanism for handling any size steel or plastic chimed drums. The model EG1SCM-F and EG1SCM2-F are knockdown units which bolt together. 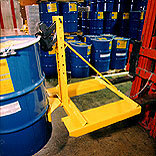 Fork pockets and safety chain provide a quick and easy installation to most lift trucks. 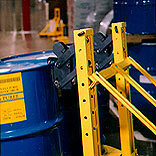 The model EG1SCM-CM attaches to the carriages of most lift trucks and walkie stackers. All models are available with a belt base and non-sparking jaws for handling flammables and can ship via UPS. Copyright © Drum-Handling.com All Rights Reserved.